Summer vacation is the perfect time to rest, have fun, and plan for the new school year! Next year, I'll be incorporating the Daily 5 and Literacy Work Stations in my classroom. I am really looking forward to it because I know that my students will enjoy all of the fun activities I have planned. I love the Daily 5 because it's 90 minutes spent reading, writing, responding to reading and writing, and working on words. I love literacy work stations because the stations remain all year so the children quickly become independent workers. I have spent a lot, and I mean A LOT of time thinking about the kinds of activities I want my students to work on during these blocks of time. I already have a lot of the activities planned and I just added a few more. I want activities that cover the common core standards and that can be completed independently by my kindergartners and first graders while I am meeting with small groups. The children need to stay engaged and on task the entire time, so the activities need to be exciting, challenging, and meaningful. I like to introduce all of the activities during my whole group lesson time and model how to complete them. Once I know my students can successfully complete them independently, I put the activities at their stations. I made these for teachers who don't have a lot of space. These can be printed and kept at your writing station. They don't take up as much room as the pocket chart cards. Children need plenty of practice drawing and writing sentences. Although this is a tough skill for incoming kindergartners, the more practice they get each week, the better they will become at writing proper sentences. Students can either write 3 sentences or 6 sentences, if you print the sheets back to back. Children use the word cards for reference. Labeling is an invaluable skill. You can choose to just have your students label the pictures or you can copy the sentence writing sheet on the back, so they are encouraged to use some of the words they labeled in sentences. I made these in color and black and white. I use black and white when I give all my students a copy and I use the colored ones in the dry erase sleeves. I don't always find it necessary to make copies for all my students. Children love making lists, don't they? These seasonal/thematic list writing templates will give the children weekly opportunities to draw and write words. Children will be successful because they are using the word cards as a reference. Once they become more proficient at writing, they don't always have to refer to them. But, for now, it helps to build their confidence. These booklets provide more opportunities for the children to practice writing words and sentences. My students love to make books and read them to anyone who will listen. They can either write words or sentences. Depends on their skill level. These books can even be placed in the classroom library to be read over and over again. Students need to learn how to express their opinions. It's a common core standard and it's a tough one! Children often know what they like, but they have a tough time telling us why they like it. These sheets are differentiated and contain sentence starters for our developing writers. Once students become comfortable with stating their opinion, they can use the sheets without the sentence starters. Writing to inform is another common core standard. Once again, these writing activities are differentiated and contain lots of support for developing writers. All they have to do is add one word to complete the sentence. Once students become comfortable with writing to inform, they can use the sheets without the sentence starters. These differentiated letter writing templates will give your students practice writing a letter to anyone at or about school and writing to Johnny Appleseed. They contain anywhere from 2 to 4 lines for writing. Children love to make up stories and these narrative writing prompts will guide your students as they dictate or write about an event. Since students are practicing these skills each week, their writing is sure to strengthen as the year progresses. Responding to literature is also a common core skill. After students are read to, or after they read a book on their own, with a partner, or at the listening station, they can fill out a book review. These book reviews can hang in your classroom library, or be put in a folder or 3-ring binder, for students to refer to as they choose books to read each day. How motivating is it to have YOUR book review be the reason someone chose that book to read?! Each month, students can fill out a writing goals sheet. They can pick just one or more goals to work on during the month and then they can use the reflection sheet to help them determine if they met their goal(s) or not. Setting goals helps you and the children gauge their progress, and helps the children increase their confidence and level of performance. Reflecting on whether or not they reached their goals helps students become accountable for their learning. Each month, you'll be able to assess your students on whichever skills you wish. There is an assessment sheet for every single skill and they are all labeled with the common core standard it is testing. You can use these assessment sheets to help you individualize instruction, and to see how much support your students need. Keep them in their portfolios to use during conferences with your students and their parents. These 10 I Can...posters can be displayed at your stations to help guide the children. Each poster contains an example of the activity the students will complete. You can hang them on the wall, put them in a 3-ring binder, or attach them to the file folder that holds the activity sheets. Although you will not be grading all of these activities, if you want to, you easily can because I included two different grading scales. One can be used to grade a single skill, like writing a complete sentence, and the other can be used to grade multiple skills, like writing a lead sentence and using details in an expository essay. Wow! This is a very long post and I bet you're glad it's finally done! I just wanted to be sure I fully explained how I plan on using these monthly activities in my classroom. If you have any questions or comments, please feel free to leave them here or email me. I'll be happy to talk to you! You can find this pack in my teaching store by clicking on the image below. You can find October and November by clicking on the image below. Click here to see the themes included in the October/November pack. And, December and January can be found by clicking on the image below. Click here to see the themes included in the December/January pack. Click the image below to purchase all 6 months at a discount! Stay tuned for February and March, April and May, and June and July. June and July will also contain activities for several popular topics taught throughout the year. If you made it through this long post, you deserve something in return! I'd like to give away one of these packs. All you have to do is leave a comment below with your email, tell me which pack you'd like if you win, and tell me why you think this pack would work well in your classroom. This offer is only good until this evening, so hurry! I forgot to add that I would LOVE it if you would pin an image from this blog post. If you do, please leave the link in your comment, as well. If you already commented, you can add the link in a new comment. Many thanks! Thank you so very much for all the thoughtful comments. Oh I would love the August/September pack if I win. These look perfect for common core. I found out the last day of school my partner will not be returning (she is staying home with her baby girl and I can't blame her)but that means I will be starting with a new partner and implementing common core. I think these will be very helpful. I would love August and September! Writing is one of my areas I'd like to improve in, so this would help guide me in the right direction. This is perfect, I love you included the I can posters! WOW! Love all the stuff. If I win, I would love to start with the Aug-Sept. pack so I can get my writing off to the right start. 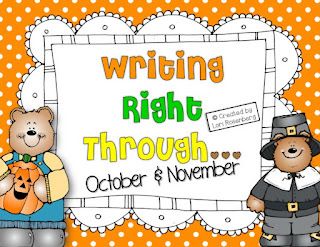 Writing is the one area I struggle with every year! These look amazing! Love them! I'd love to start the year off and running with Aug/Sept. I'd love the Oct/Nov pack! I was just hired as a first grade teacher for next year and I think that would time perfectly with when our kiddos start to develop independent behaviors and I can start small groups!! Wow! Looks awesome! I'd love to start with August September pack. I am starting literacy work stations this year and think this would be a great addition!! Hope I win! Wow! These look amazing! I really need to "beef up" the writing lessons in my classroom. I would love to have the August/September one because it would be great to start the year with some fun, new ideas! On a side note... I think you will LOVE literacy workstations... I know that I do! This looks great! If I win, I would like the October/November. This would be great for my kiddos because writing is the hardest thing for them. Lori, this looks FANTASTIC!! It leaves me thinking, "Where has this been my whole life?!?!" Once again, fabulous job!! These look awesome! 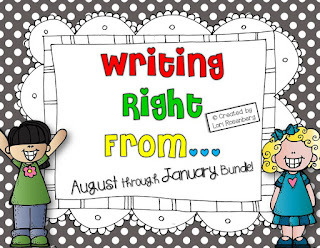 I purchased your writing pack and I'm looking forward to using this year in first grade! :) The Aug./Sept. one would be great for the beginning of the year! What a great set of writing activities! If I get to pick one, I'd pick the Aug/Sept of course, so I can get started right away. Looks amazing!! I would love to win the December/January pack. I think by then my Kindergarten students would be able to handle most of the writing samples. THANKS!! I would love the Aug/Sept pack to get started the right way this school year! I would love August and September! These would help me get off on the right foot! They look great! My goodness that looks like a lot of work! Love it all! I would love the Dec/Jan pack! This will give me a few months to get my Kinders familiar with writing and then they would really be able to enjoy this in the writing center! They all look great! These are so amazing! I'll be a first year teacher next year and would love to have the August/September packet - I feel like the August/September packet would set me up for success the rest of the school year! I also plan on using Daily 5 and Literacy workstations, I observed a classroom after I completed my student teaching and fell in love with what the teachers were doing utilizing both. You are FANTASTIC! All of these are wonderful, and I can't wait to see the rest! I would love to start the year with the first pack. I, too, struggle with the teaching of writing. This would be a fantastic addition to our Literacy Centers! I would love to win cos teaching writing is not my strength! Your pack looks amazing! I'd choose the August and September pack! Thank you for offering this opportunity. 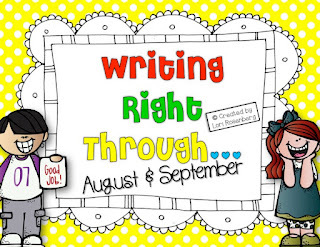 I would love to try your August/September writing pack in my kindergarten classroom this fall. I feel that this is an excellent way to try out these writing packs to see if they work for me and my students. I would love the Aug/Sept pack to get our year started off right with our writing. Truthfully, they are all awesome!! Your work is amazing. Thanks for the giveaway. I'm looping with my kids this year. They truly struggle with writing, this would be perfect for them. I love this!!! Thank you so much for all your hard work!! If I won, I would LOVE the August/September unit so I can get started on the right foot this year! I'm attending a conference this summer to help with my writing instruction and I know this will be a great resource for me to use!! Thanks! Wow!!! I would love any of them really...but aug/sept would definitely get my kids started in the right direction! I was afraid of writing when I first started teaching, but I LOVE it now! Aug/September would be amazing to win. I feel like writing is an area I am weak in and this would help give my firsties and me a great start to the year. I would really love to win the August/ September pack because it would be a great way to start the year. These packs are a perfect way to practice writing using the common core standards. Thanks! Wow! These are really great. I would love the Dec/Jan packet because I think my students are ready for different types of writing around then (I teach K). Wow! This looks AMAZING! I hope I win! These look so neat!! I don't wanna choose just one..... :o) If I HAVE to, I'd like the October & November one..... Fingers are crossed!!! I would love the August/September Packet. I think this would be great to use with my EIP students! Looks incredible as always! I would love August/ Sept to start the kids off on the right path. This is my weakest teaching area. This look AMAZING! I would love to win the Oct/Nov. I work in two schools with k-2 special ed students and with common core and IEP goals this may save me a few minutes all while having fun! Thank you for the chance to win. Hoping today is my lucky day! You did such an amazing job. I work with Kindergarten students. I am looking for something to use with my students for writing. I feel like every year I don't have something solid to use. You have put a lot of thought into this. Thanks! I would love the Aug./Sept edition to start my year off right! 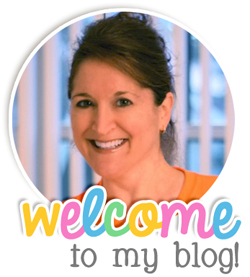 Just discovered your blog, and I love all your fabulous ideas!! I'm your newest follower and a brand-new, just-hired kindergarten teacher. I'll be checking your blog and TPT store often for more super ideas. Please drop by my NEW blog and leave me a comment with your suggestions for it. Would love to win Oct/Nov to start using with my kids after we get in the routine of being in school!! I'd love the December/January packet. I think my students would be ready for these activities by then...and also, January can be a slow month after all those holidays! These look awesome! I would LOVE trying out the August/September packet with my new firsties this fall. Thanks for sharing! I would love to start the year with your August/September pack! I've pinned on Pinterest too! I would love the Dec/Jan packet because of my students will be able to write by then. I would love to try the August/ September packet. I pinned it http://pinterest.com/pin/190628996700284760/. Love, love, love the Aug/Sept pack (and all of them of course!) and would love to win that one. I pinned to Pinterest! I would love to win the December and January one!! I'd love all of them beciSe I would have awesome kindergarten writers!!! I pinned the December and January one into my Unit Activites board on Pinterest!! Here is the link. My e-mail address is amymcelveen@yahoo.com THANKS! I would love to win the August/Sept packet. These look wonderful! I teach kindergarten and these would be a great addition to my writing station! Thank you! Wow! These packets look amazing! I love how they have each different type of writing every month. I've been doing Daily 5 for 3 years now and this would be a great new addition. We begin school after Labor Day and with all the testing etc. in September, I think I'd probably start with your October/November Packet. Thanks! I'm so excited to read your post because this is what I've been wanting to do. Thank you so much for sharing! Forgot to add my e-mail above. 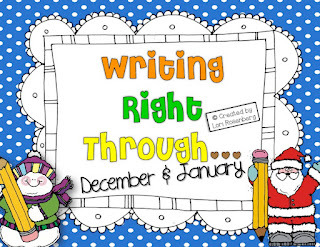 I'd love to win Writing Right Through the Year. It looks amazing! Thank you for posting it as a giveaway. This series looks fantastic and you have done all the work that I haven't had time to do!! THANK YOU! I implemented Daily 5 this year and have loved it, however, I knew that the writing component needed some improvement. This series is the answer! I would love the August/September pack so I can start at the beginning of the series. Thank you for such a long, detailed post explaining the different components of the series. WOW! What an awesome packet for writing! I would love to have the August and September packet. It would give me the push I need to do more writing earlier in the year with my kinders. You have it all laid out so wonderfully! Mega cute and love that it aligns with CC. I'd love the October/November pack!! I would love any of these. Giveaways are so much fun. Thanks! This is AMAZING! I love all the choices!! I'd love to start off with the Aug/Sept pack!! b822b@yahoo.com Thanks!!! I love reading about your Daily 5/Literacy workstations decision and the thought process that got you there. I would love the August/September to start it out at the beginning of the year. This looks so amazing. I would love to win the Aug/Sept pack. I love how you are keeping the activities the same, but changing themes. I like to do that with my minders. Ohhh, I didn't follow the dirctions!!! I forgot and put my comment on your FB page and not here on your blog. "Oh, I would love to win, also! (Be sure to take some time off for yourself this summer!) seaberry@cfl.rr.com". I didn't see the link earlier, and just saw it now. WOW, what a lot of work, but something you can feel really proud of! I sure hope I win! LORI! Thank you, thank you, thank you!!! I LOVE this product and can't wait to start using it!! Girl you are amazing! I love everything you do and these are for sure going on my wishlist!